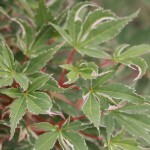 An upright, vase shaped tree with delicately cut leaves that are pink-margined in spring and mature to soft blue-green with creamy edges. Fall color is scarlet. As with many variegated plants, this prefers some shelter from late afternoon sun. It prefers a well-drained, acidic soil.